I am almost at the end of my internship in Sto Domingo and Caribbean Summer programme with Interdom. 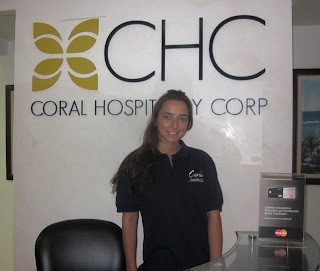 I have been working in the main office of Coral Hospitality Corp, a Dominican hotel management company, currently managing hotels in Cap Cana, Samaná and Juan Dolio. My job was based in the department of sales and marketing of CHC, where I have had different tasks to complete. Each task was quite different, depending on my colleagues’ positions and responsibilities. For example I had to create and translate some articles from English to Spanish and vice-versa in order to be posted in the News section of the company´s website. This task was very useful because it helped me improve my written Spanish and learn new vocabulary. It was an excellent exercise to keep up with the news in the country and constantly revise some grammatical aspects and vocabulary. 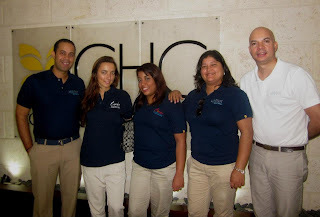 Aside from this, I had the opportunity to visit two of the hotels CHC manages in Cap Cana, a very luxurious and high-standard Dominican Resort, still in development. This was possible because of a photo shoot to provide pictures for the new flyers, fact sheets and videos to promote and advertise the hotels all over the world. It was a very satisfactory experience for me due to the fact that I have been chosen to be the feminine model in the pictures and videos.